My attorney friend Bob Sullivan wrote this after a cruise with us and a trip to Israel. Interesting observations by an astute observer concerning the heart of Islam, pilgrimages and us. Last Christmas, my wife Carmen and I hopped on an airplane and flew to the Holy Land. We were extremely excited. It was not our first pilgrimage, but It was our first pilgrimage to the Holy Land in Israel. Several years earlier we had gone on a pilgrimage through Greece and Turkey with Steve Ray (In The Footprints of St. Paul). Pilgrimages have been an important part of the Catholic faith for a long time, and while you can go on a pilgrimage without ever leaving the country, sometimes without leaving your hometown, there is obviously something very special about walking on the same path as Jesus and His Apostles. 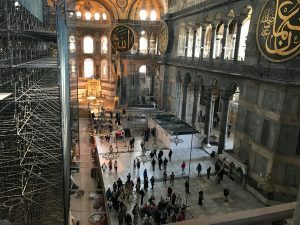 While our pilgrimages in Israel, Greece, and Turkey, were extremely powerful and moving experiences, one less than pleasant fact has also stuck with me: Islam truly is hostile to Christianity. It isn’t just Isis, the Taliban, and other radical Muslims. Islam is not content with its current status in the world. Unfortunately, we Christians are more than content. In fact, we are derelict. A quote from the Qur’an. Several years ago, as our ship cruised into the Port of Istanbul, Carmen and I stood on the upper deck with some friends. It was an eerie feeling to be entering what was once the seat of the great Byzantine Empire, the great city of Constantinople. 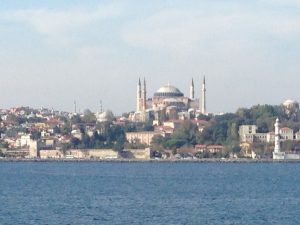 From our ship we could see the Hagia Sophia (the Church of Holy Wisdom), which was the largest Catholic, then Christian Church in the world for nearly 1,000 years. Byzantine emperor Justinian I commissioned its construction, which was finished in 537 A.D., or about 33 years before Muhammad was born. Muhammad invented Islam in about 610 A.D. In the centuries to follow, Muslim invaders tried to capture Constantinople numerous times. They finally succeeded on May 29, 1453. Muslim warriors quickly took over the Hagia Sophia and turned it into a mosque, demolishing or taking all of the accouterments and valuables. The Hagia Sophia remained a mosque until 1931, when work began to turn it into a museum. We could also see the Blue Mosque, the main mosque in Istanbul, which was built near the Hagia Sophia in order to claim, even more aggressively, Islam’s conquest over Christianity. In an effort to modernize Turkey, its first President, Mustafa Kemal Atatu?rk, initiated a number of new laws, including the prohibition against wearing of clerical garb in public. This applied to Muslims, Christians and other faiths. As we silently stood on the top deck of our cruise ship, scanning the enormous city around us, I recall that one of our fellow pilgrims, a bishop, asking one of our guides if he could still wear his clerics when we entered the city. He was assured he could. The law only applied to Turkish citizens, not visitors. After we disembarked and made our way to the Hagia Sophia, we were greeted with the Zuhr prayer, the prayer Muslims pray at noon each day as part of their five-part Salat prayers. We were standing just outside the Hagia Sophia when the prayer began to blast all around the city. We had to pause our tour until the prayer was over because it was so loud, it drowned out the voice of the tour guide. The eeriness we had felt on the upper deck of the cruise ship returned as we waited for the prayer to end. After a bit, we entered the Hagia Sophia. Although it is still a museum, it is really just an enormous empty building. The only evidence of Christianity which remain are a number of ancient mosaics which were uncovered after it was converted into a museum. Only some of the mosaics are exposed. You can see Jesus, the Virgin Mary, and angels because Muslims also believe in them, just not the same way we do. There are also many beautiful geometric designs which are not contrary to Islam. However, much of the walls and ceilings are still either behind plaster, or they have been vandalized or fallen victim to the many earthquakes which have plagued Istanbul over the centuries. Also remaining is the mihrab, a niche in the wall at the point nearest to Mecca, toward which the Muslim congregation faces to pray in a mosque. The church’salter had been torn out by the first Muslim invaders in 1453. The church had been built facing East, but since Mecca is not true East, the mihrab sits to the right of the former sanctuary, making it look strange and off-center with the architecture of the church.